Are you missing out on the fun here at IFR? Subscribe to my feeds using Google Reader or Bloglines. Taste of India continues to have problems getting the latest updates on my feeds. Health insurance agencies control our decisions about our health, right down to the medication they will allow us to take. I've been battling a sore hip with pain radiating down to my ankle for more than the last couple of weeks - I think I finally figured out what I did to bring this on - and I've been balking at the idea of going to the doc, only to be thrown out in less than 10 minutes because it's nothing and then be presented with a $200 invoice shortly thereafter. But I can get treatment when I want it, for however frivolous a reason it might appear to be. It remains within my reach, with or without these health insurance agencies. We may have heated discussions about how medical tourism is adversely affecting hospitals in America when foreign nationals fly in, head straight for the hospital and fly out without paying their hospital bills. Or we may have mixed emotions about the recent case about the blind Ecuadoran, without health insurance and not qualified to receive Medicaid, who was 'dumped' by a leading hospital in New Jersey, only to show up in another hospital nearby and that led to the latter suing the former. It is the lack of primary health care at the appropriate time in developing countries that leads to such desperate acts. Medical tourism is a booming industry in India and there is cutting edge technology available - but only to those who can afford it. For most of the population, it remains a pipe dream. You may need surgery now but you will get it only 6 months from now. To get it now, you have to be 'equal' to those who can get it now. Yes, you need tens of thousands of dollars. Anita Lakshmi is one such individual. She is a 28 year old woman, with two very young children, who needs heart surgery as soon as possible. If she joins the line, she may get it in another 6 months. But by then, she will most probably have succumbed to the disease, leaving her children without any responsible parents. Her husband has already left her a while back. Anita Lakshmi's parents work as domestic help in the home of an Indian food blogger we all know very well - Srivalli of Cooking 4 All Seasons. Anita Lakshmi needs about $15,000 for heart surgery and subsequent care. Her parents have already spent their life's savings for her first surgery and have turned to Srivalli for guidance for Anita Lakshmi's future care. Kudos to Srivalli for doing all the right things to ensure treatment for this young woman, who can have a future if she gets the proper medical treatment in time. Please do read about the fund raiser on Srivalli's blog and Chip In to help Anita Lakshmi. Even $10 will help. That might mean going without two Starbucks Coffees in your work week. Maybe brew your own cup before you leave for work? And help bring Anita Lakshmi closer to getting the treatment she needs and rightly deserves? Think about it. Just two Starbucks Coffees. If you can donate $25, that would be even better. That might mean carrying your own lunch from home for one work week, or less. It will mean life to Anita Lakshmi. These coasters are sealed with a water-proof sealant, making them ideal for use with cold and hot drinks. They are great to look at, too! These coasters are the work of a 10 year old so please keep that in mind when you bid for them. 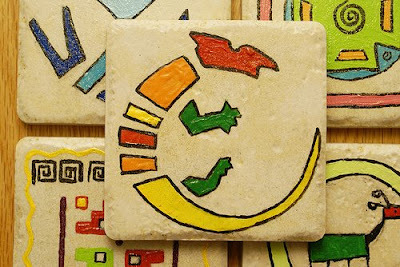 You may bid for Medha's coasters if your donation to the fund raiser is at least $15. At this time, please note that shipping is only within the US. Here is a list of all the raffle prizes and instructions on how to bid. I sincerely hope you will help. Because that's what friends are for. Speaking of friends, Mad Hatter Anita is celebrating the second anniversary of her blog. And like last year, she has created a shortage of cooking oil as everyone rushed out to buy oil to do some wholesome frying. All, except some spoilsports and other copycats. Happy Second Anniversary of your lovely blog! So what if you copied the title of my ode to your blog from last year for your own entry to the celebrations this year. I will assume you either have photographic memory like Kaavya or that you were inspired. I like the latter better. I feel honored. Even if it's me who is honoring myself at this time. So what if you ignored me when I proclaimed that your blog was so well written. 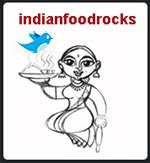 I still say it is the second best written Indian food blog around. Mine being the first, of course. So what if you ignored me again. But since I know a good thing when I see it and I don't give up easily, I forced you to take notice. Anyway, despite my sore hip and general malaise, and despite the desperate desire to lose weight, I, too, joined the masses in the line for some cooking oil. And here is the recipe that you should follow henceforth. Peel and mash the boiled potatoes completely. There should be no chunks. Add mustard seeds and when they pop, add asafetida, green chillies, and kadipatta. Add turmeric powder, ginger and garlic and stir till you can smell their fragrance. Roll into balls - usually the size that fit your mouth. Naturally, mine are very small. After much hand-slapping and pilfering, I had 15 small vadas, waiting patiently to go for a swim. Heat lots of oil in a kadhai. 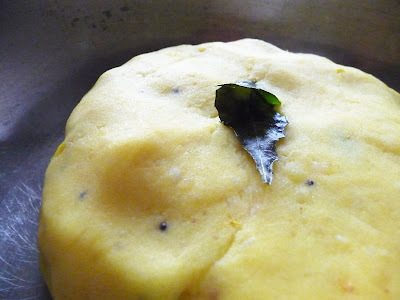 Approximate depth to which you should fill the kadhai with oil depends on the size of your vadas - it should be slightly more than the size of your vada. While the oil is heating, take the besan in a bowl and add water to it slowly, mixing as you add. Prepare a batter that is slightly thicker than pancake batter. 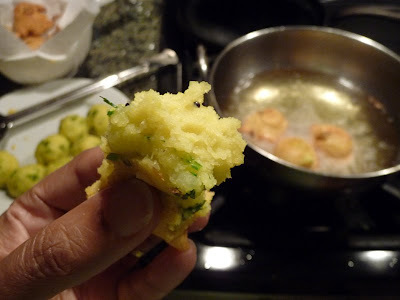 It needs to coat the vada and not slip off into the hot oil. Add salt and red chilli powder and mix well. I also like to add turmeric powder - about 1/8 tsp - to the batter. It's up to you. Line a plate or large bowl with paper napkins. Please avoid using newspaper or sheets from a magazine as newsprint is not the something you want on your food. Test the oil for readiness by releasing a drop of your batter into it. Like a good Olympic diver, it should make a clean entry and surface immediately. You know you're all set to send the vadas in next. Drop each vada into the batter and ensure that it is coated well, and drop it into the hot oil. Repeat this until you have 4-5 vadas in the kadhai. Turn them over after a few minutes and fry until they are a beautiful golden color. For a great technique, see How to Fry Batata Vadas Without Getting Your Hands Dirty. Serve hot with thecha and hot tea. 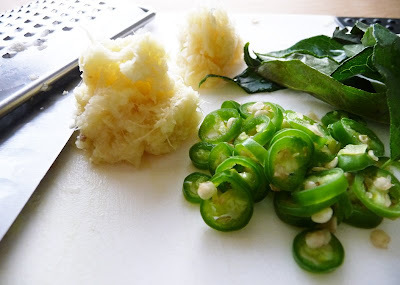 Ideally, ginger, garlic and green chillis should be pounded to death in a mortar. But since we have taste buds in training, we need the green chillies to be visible so that they can be yanked out at will. My Indian grocer cursed himself for being out of thecha. I was so committed to the batata vadas that I went to the other Indian grocer in my area only to find that he had gone out of business. I was not committed enough to make it myself. In fact, I was so exhausted by the end of my day - sore hip, remember? and I worked in my yard, too - that I didn't have the energy to make cilantro-chutney. So I served it with the best ketchup in the world - Heinz Organic Tomato Ketchup. My husband says it tastes just like Kissan, which would make Kissan the best ketchup in the world but I was never a fan of Kissan. Heinz Organic Tomato Ketchup is really by far the best tasting ketchup ever. You may see baking soda or soda bicarb or Eno fruit salt being added to the batter in many recipes. I think baking soda is over-rated when it comes to making things crispy. 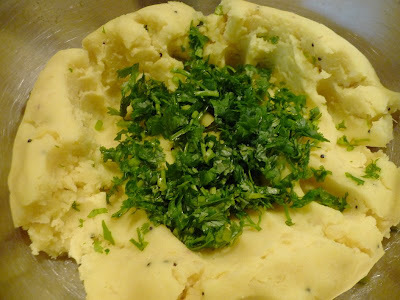 It makes the batter froth and less batter can then be used over more vadas - a trick that the street vendor uses to maximize his return on investment. I prefer to avoid baking soda in my cooking as far as possible because I don't like the flavor it imparts, especially to fried or steamed foods. Manisha, Thank you so much for your support!.. That was really beautiful Manisha. I know a classic IFR post when I see one! Have you considered seeing a chiropractor for that hip? It sounds very much like a vertebrae is out of alignment and putting pressure on your sciatic nerve- I've had that a few times myself: totally impossible to be comfortable enough to even sleep! Thats a very nice post Manisha. I hope Lakshmi gets all the support. Anita will be very happy to read this post :). I will have to try your authentic batata vada sometime (may be after two months when things come to normal again in my world). Where is Pel's entry? I thought he loved vadas. beg to differ...me no spoilsport. reminds me when swanky malls first came up in India. Couldn't enter some of them if you didnt have a credit card. What if I could pay my way with cash? Oil was not part of the event, only the vadas and they got there in style. Shilpa and Priya agree! beg to differ. heinz organic tomato ketchup is crap compared to our two minute ketchup made at home with organic tomato paste. Likewise, my friend, likewise - I have enjoyed every moment of this virtual friendship! This when we are so different - even in that first response I made it clear that you were talking to a tech-challenged person - how exasperation this friendship has been for you at times! But there are pluses to the internet and I learned to use some of them! I will like to state for the record that there have got to be many variations of batata vada - and yours looks like a mighty good one! :D Will surely try! LOL! Ohh ohh .. I had missed the link to me about spoil sport and I somehow thought u had spared me!!! Anyway..instead of calling us that, you should also try making different vadas in that pan and you will love it (and Medha will get to eat some real goodies some time :D). What an eloquent post Manisha! The heartfelt appeal, the ode to friendship and the efficient recipe! Kudos! a fantastic post and here's to virtual friendship - as unlikely as it may seem the blog world knits so many different people together. Srivalli, Lakhsmi is lucky to have you in her life to provide guidance and support during this difficult time! Shilpa, it is certainly heartening to see the ticker go up. I would like to see it go up some more. Jai, swanky malls, credit card, cash? I'm beginning to think that you should have wiped that hot pan right away and put it away. She did give you a concussion with that aebleskiver pan, didn't she? Oil is always a part of Anita's greasy events. What you did cannot be called frying. She said "go forth and fry, suckers!" And we all did. Except you. You sweated the things. Oh and when will you get your own account? That must be why you had all those problems at those swanky malls. Luckily for me, I missed that phenomenon entirely. Anita, record? What record? We're talking street food, here. "Essence of Bombay" etc. Your words. Of course there are variations but then they are Pappu's nani's traditional recipe or Chintu's mami's variation. They are not the essence of Bombay, which is the authentic batata vada. Even mine is not nearly authentic - the green chillies need to be pounded and you need more than what I used. So there! I thought I had invented "Deep Fried Love." Sigh. I guess not. Shilpa, did you read my post about Simple Living? I will not use that pan on a regular basis. Until I know I will, I won't be buying it. I am currently getting rid of as much stuff as I can. Samantha, I am leaving your comment as is for sheer comic relief. A drive-by spammer who cannot spam properly is quite hilarious. Thank you for linking to my blog twice in your comment. Welcome to IFR! If you stick around, you might learn to cook good nutritious food. This oily treat is an aberration in the regular programming. Miri, thanks! Let's do our best to help Lakshmi get the treatment she desperately needs. Meeta, they totally would. Anything with potatoes usually works for me. It won't be the Bombay batata vada though. Hee! Hugs to you! Bhagyashri, the outer coating becomes thicker because of the baking soda, too. 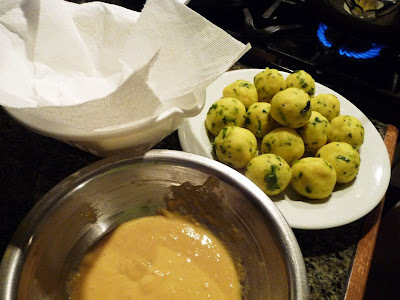 We don't like it to be so thick as the homemade batata vadas are smaller. So the taste of the fried batter competes with the stuffing, which we enjoy more. These were so good that Medha insisted on taking them to school for lunch. She said that if anyone had anything nasty to say, it would be their problem because they would be missing out on really good food. Yay! We're getting there! Wonderful post! hope Lakshmi gets the suppport. Hope ur hip pain goes away soon, Take care. 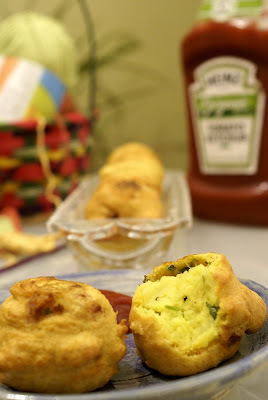 Hope Medha's school chums liked the vadas.. if they don't they are indeed missing out on something awesome! oooh...reminds me of my college - monsoon in Vadodara, the muddy campus, and the canteen serving hot batata vadas with a super-spicy green chutney! Manisha, so much covered in one post! Your posts have always been very informative for me, plus the real fun to read the comments to ur friends- Anita, Bee-Jai, Pel in their posts and vice versa! Ur writeup never ceases to amaze me too,and u hv to invent a new name for your style of humor! Hope the pain in hip fades away. Manisha, you are making my mouth water! I have never had batada vada...is it a specialty of the North? I'd love to make this, but know I'd wreck it...chalk this up as one more thing I want to eat at your house, my friend. Dana, batata vadaa will probably be on the menu for the next S&B.